Deploying a PHP web application involves either uploading files to a server via FTP, or committing and pushing to a master branch of a Git repository. There is nothing complex about it. Deploying a Rails app is easy according to the official Rails documentation. As much as I love the official docs, they have got that part badly wrong. Deploying a Rails app can be a massive headache, not least because there are so many options. In the end though, it boils down to two things: you can either deploy to a cloud based service where most of the hard stuff is looked after for you, or for more control, you can deploy to a Virtual Private Server (VPS). We’ll take a look at both options in this series. We’ll choose Heroku as our cloud option, since it is very popular for Rack and Rails app deployments. You deploy to Heroku by pushing your changes to the Git remote that Heroku provide for you when you first create the app on their service. It should feel familiar for PHP coders transferring to ruby, especially if you have used a cloud platform like phpfog for example. Heroku doesn’t support Sqlite, so if your app uses it, Heroku will complain. Heroku uses the excellent Postgresql. During the initial deployment of your app, you can run your migrations to populate your Heroku Postgresql database. If you have moved to developing with Rails from PHP, you’ll be used to MySQL. In which case, you have nothing to fear from Postgresql. It has gained in popularity with Rails developers recently, so it is well worth getting used to. If you are still considering using Sqlite, this article on the Heroku dev center should put things into perspective for you. The next thing that will happen is Heroku will respond by telling you your app has been created. It is highly likely that it will have an odd name (infinite-escarpment-4759 for example), but we can change that shortly. You will also be told what your Git remote url is for Heroku. The nice thing about that is, you can push your changes to Github for example, and then, when you are ready to deploy, you can push to your Heroku branch. you might see a deprecation warning about the plugins in vendor/plugins. You can safely ignore the warning if you know you haven’t done anything with plugins. The other option is to buy yourself a VPS, and deploy your app to that. The one I’m using here is called Linode. The first thing I should point out is that, if setting up servers doesn’t appeal to you, then choose Heroku. When you sign up with Linode, you can choose the (Linux) server operating system. They have Ubuntu, Fedora, OpenSUSE etc. so your favourite will probably be supported. It is also possible to create and tear down if you go wrong. In fact, it’s encouraged on Linode. So if you are a Linux n00b, there is plenty of help and support. When your server is set up it is a raw, basic server installation. That means, to get a Rails app up and running you will need to do some installing first. Oh, and in case you were wondering, no, there isn’t a GUI. It’s command line all the way. You have options here. I ended up going with Nginx for a web server, PostgreSQL for database stuff, and rbenv to manage Ruby versions. You could just as easily choose Apache, Phusion Passenger, and MySQL. I made these choices because I had already tinkered with Phusion Passenger and RVM, and wanted to try the other options. You will need to install Git and Curl too. Assuming that you will manage your source code through Github, it’s a good idea to add an ssh connection to it from our server. While still logged in, do: ssh git@github.com. This will ensure that when we deploy via Capistrano, we shouldn’t get any “unknown” errors. The idea is, that before we deploy via Capistrano we can check that everything is committed to Github first. Now you can develop and push to github as normal; your Linode server is nearly ready to recieve the deployed app. First though, we need to set up Unicorn and Capistrano. Unicorn is a HTTP server that works nicely with Nginx for running Rack applications. Capistrano is one of the many ways to deploy a Rails app in a semi-automated way. Back on the command line, in your application directory run the capify command. That will create a Capfile and a config/deploy.rb file, both of which, will need to be edited. It’s beyond the scope of this article to go through the file in detail. However, you can see that there is a section for setting up roles for the web app and the database, and also, the directory that the app will be deployed to. Our Github credentials are included, and there is a section for making sure all local changes have been committed before the deployment runs. This is a standard config file for Nginx that maps to the location of your app. You can find sample nginx config files here. You can see a sample file here, but the file basically sets paths and the number of worker processes. This file also goes in your app’s config directory. Again this goes in your app’s config directory. It is a fairly generic script with variables that will need to be adjusted at the top of the file. This script will also need to be marked as executable. It is a good idea to set up another user on your VPS, so that user’s credentials are used rather than root, for the user that appears in the various config files. You should commit the config files to your Git repository too. 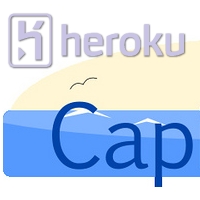 Now you can run: cap deploy:setup to begin deploying the application. the command will log into the server using the user account you set up. It will also create the various directories specified in your config files. You should now be able to run: cap deploy:cold. The ‘cold’ option means the database migrations will also be run. You may see errors at this point, but the output will give you an indication as to where the problem is so it can be fixed. You should now be able to browse to your site and see your app running. The fastest and most pain free way to deploy a Rails app is via Heroku, there is no doubt about that. However, it can get expensive, and you don’t have finite control over your application. For as little as $20 per month, you can have a full featured, virtual private server to configure your own way and with maximum control over the apps you deploy. It is a much more involved process though.